The Su-47 «Berkut". A photo. History. Characteristics. The Su-47 "Golden eagle". A photo. History. Characteristics. Su-47 «Berkut" - a Russian perspective carrier-based fighter, which is engaged in the development of OKB. Dry. The composition consisted of the wing structure, having reverse sweep, composite materials have been widely used. Chief designer of the project has been MA Pogosyan. At the beginning of the creation of the project was the name of Su-37. It developed as a promising fighter model with forward-swept wing, created for the Soviet Air Force (modernization of Su-27), but in 1988, the program has been closed. New customer for the Su-37 was the Soviet Navy, and the project began to develop as a promising fighter for aircraft carriers. The aircraft received index Sioux 27KM (modified version of the ship). After the collapse of the Soviet Union, the whole scope of Aircraft plunged into a deep crisis, and all the funding for the project was on the shoulders of the Sukhoi Design Bureau. 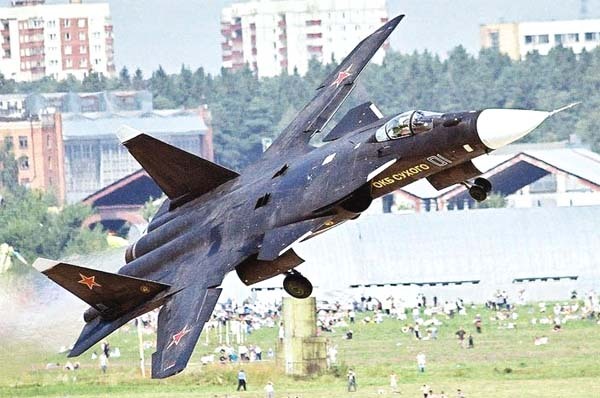 The first flying prototype was able to build only 1997 year, he was given the name of Su-47 and presented to the public in 1999 year's air show MAKS-1999. In 2001 was it was renamed and became known as the Su-47 «Berkut". The airframe composite materials have been widely used. Their use is possible to increase the weight returns to 20-25%, increased resource in 2-3 times and labor costs for the production of parts is reduced by about 50-60%. Composite materials gave the car radio and the necessary thermal characteristics. However, as shown by the US research on the aircraft F-22A, construction of carbon fiber more susceptible to mechanical abrasion, respectively, the device becomes less resilient and tenacious. This is not true of structures, mainly made from titanium and aluminum alloys, which are well withstand the high amplitude of temperature and pressure. The Su-47 arranged according to the scheme of the integral triplane unstable, having a high wing swept, tsentralnopovorotnoe rear empennage small area. The aircraft has the ability to perform dynamic braking at different speeds when the permissible value of the angle of attack. During the production of parts new technology has been applied: the details of cladding could be obtained in the form of flat, then it was attached to the required shape, curvature and is their interface with the required accuracy. Due to large-sized panels managed to reduce the number of fasteners in construction. This reduced the fighter's weight increased aerodynamic performance and reduced visibility of the aircraft on radar. The structure design includes composite materials for self-unloading and self-adapting structures. Most of the elements (on-board systems, chassis, lights) were taken out of production aircraft Su-27. Su Wing-47 has a reverse sweep, to 90% is made up of composite materials. It has a collapsible front of the console. The surface of the wing panel is equipped with a deviating toe, and on the back surface are aileron and flap-section. Basically, the fuselage structure is made of titanium and aluminum alloys. It has close to the oval cross-section. The nose fairing has a front flat and fins. The tail part is occupied by two of the fairing, which you can use in the future to accommodate the electronic devices. Vertical tail is similar in design and execution of the Su-27, but smaller in size than its predecessor. The collapse of the keel directed to the periphery, along with a small square during the unit becomes poorly visible to the radar instrument. By lantern resembles a glider cockpit Su-27. The angle of the walls of the pilot's seat is 30 °, it protects it from overload during the execution of aerobatic maneuvers and combat figures. The main landing gear is attached on one wheel. Cleaning of the main landing takes place in a niche arranged on the sides of the inlet. Pillar forward rotating retracts into the fuselage. On the experimental version, two turbojet engines D-30Fb placed in the tail of the fuselage were installed. Next, it is planned to equip the fighter with AL-41F engines, which have a thrust vector control system. Air intakes are unregulated, have sectional shape close to the sector of the circle, are under the influx of wings. The shape of the air ducts is S-shaped, this allows the shielding of the compressor blades of the TRDDF. On the upper area of ​​the fuselage are two doors, which additionally draw in air during maneuvering, take-off and landing of the aircraft. Su-47 equipped with modern domestic on-board equipment. This includes multi-channel digital FBWCS, integrated automatic flight control system, navigation system, which includes an inertial navigation system with laser gyros and satellite navigation. Aircraft cabin is equipped with an advanced system bailout pilots and life support system. The management plane is operated strain gauge and throttle control lever side malohodny. In order to increase the lateral review, antennas and electronic equipment made of small size and placed in the rear. Besides the main radar, in the aircraft navigation equipment includes 2 antenna, providing visibility to the rear. They are mounted between the engine and the wing nozzles. Radar housed in the nose of the glider. It was completed with a flat antenna phased array, the operation of which is performed in the X-band. Onboard radar equipment can detect targets at distances of up to 240 km. Su-47 has the ability to simultaneously monitor and support to 24 goals with eight missiles against enemy air targets. Armament: possible installation 30-millimeter gun GSH-301. I saw the demonstration flight of this aircraft at the MAKS-2001 airshow. Appearance is impressive. The wing of the reverse sweep is something futuristic. It seems that the aircraft is clearly ahead of its time. In the sky it rushes, it maneuvers smartly. When he flies, he practically does not make a noise, but then, after he disappears from view, a wave of noise is covered, and his trace is cold. Very interested in me and I began to study what he is for such an animal. Designers obviously loved the plane. The most modern equipment was loaded on board: an integrated life support system, a remote control system, an optronic-electronic aiming system, and a weapon compartment-all this makes the aircraft interesting and efficient for performing hidden operations. Actually, as it turned out, it was created for this purpose. Our response to the American "Stealth", only more dangerous. Once again I saw him at the MAKS-2003 airshow and he still seemed new to me, even though I knew everything he could about him. This time I was able to better see and marvel that the aircraft looks like a single whole. Refined and quick. A truly formidable weapon. Yet it was not for nothing that the Americans were frightened at the time. One upsets, sorry the project did not become serial. Bell P-39 Airacobra. A photo. Characteristics.